Woven jute fabric was treated with sodium hydroxide solution of different concentrations at room temperature, for different periods of time. After that, jute fabrics with gradually decreased content of hemicelluloses were obtained. 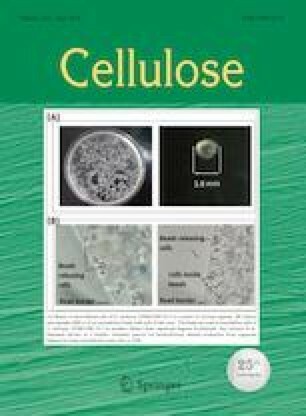 The changes of the sorption properties (moisture sorption, water retention power and degree of fiber swelling) and dielectric properties (effective relative dielectric permeability, AC specific electrical conductivity and dielectric loss tangent) of alkali treated jute fabrics were investigated. After the alkali treatments, the degree of accessibility of the cell wall components to water vapor increased with increased severity of the alkali treatment. In parallel, the degree of fiber swelling and total water holding capacity of the fabrics were increased. The dielectric properties are very sensitive to fabric structural characteristics, chemical composition and its ability for moisture sorption. Thus, the obtained increase of the effective relative dielectric permeability after the alkali treatments can be attributed to the changes in the structural characteristics and decrease in the content of hemicelluloses, which further contributed to an increased ability for moisture sorption. The changes in the AC specific electrical conductivity can be explained by the fact that the hemicelluloses not only restrict the freedom of the water molecules to take part in the polarization process, they also change the structure in such a way that the mobility of the ions in the electric field is restricted. The values of dielectric loss tangent increased after the alkali treatments due to the increase in the number of polar groups. The online version of this article ( https://doi.org/10.1007/s10570-019-02421-0) contains supplementary material, which is available to authorized users. Authors are grateful to the Ministry of Education, Science and Technological Development of the Government of the Republic of Serbia for funding the study under the Projects (OI 172029 and OI 171029). The authors also thank Goran Dembovski, (Faculty of Technology and Metallurgy, University of “Ss. Cyril and Methodius”, Skopje, Macedonia) for air permeability analysis.